With spring crops comes some familiar spring pests. The following notes may help avoid being shocked by unwelcome infestations later on. 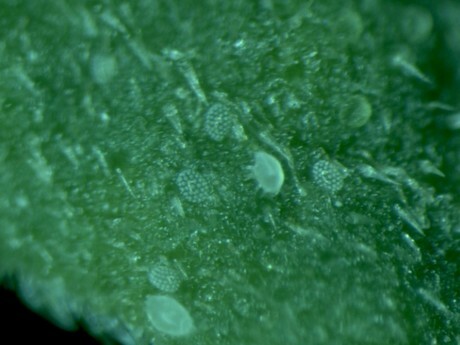 This very tiny pest causes big damage, such as odd stunting, bronzing and distortion of new growth, often surprising growers who report it appearing “suddenly.” It can indeed be hard to detect early as symptoms are initially subtle, can be spotty (single varieties or just a few plants affected), or resemble those caused by environmental or cultural factors. The pale mites are nearly invisible to the naked eye though more or less easily seen under magnification (10x+). They are often found wandering on foliage when humidity is high, but when dry I look for the eggs, which are pale white or nearly translucent and oval in outline with small raised dots. Broad mites are most associated with vegetatively propagated plants like New Guinea impatiens, some begonias, some ivies, etc., though given a chance they will thrive on seed-grown plants too. While not an advocate of unnecessary preventive insecticides, this is one case where treatment may be justified particularly for hanging baskets as developing infestations can go undetected for too long. Treating plants in cell trays prior to transplanting is one approach that also reduces cost. Keep in mind only certain miticides are labeled for broad mite; those with systemic or translaminar activity include Avid (or Sirocco, generics), Pylon, Savate (formerly Judo), or Kontosthat may be better where coverage is difficult. Akari, SanmiteSC (not for Nassau/Suffolk Counties, NY), and Magus (not for roses) can be effective where coverage is good. We had very good results with a horticultural oil in one trial and M-Pede (or other insecticidal soap) can also be used. Note plant sensitivities on these labels and avoid placing baskets drenched with Kontos over sensitive crops like zonal geranium, if runout will occur. Preventive releases of predatory mites (N. cucumeris, A. swirskii) can also be done, but be sure to keep the sachets (if using) touching the foliage so mites can get to work immediately, and not have to cross a wasteland of media. Foliage of adjacent plants should be also touching to allow mites to move easily among plants. Always verify the biocontrols are alive and arrive in the expected number; report any issues to suppliers immediately. Incidentally, cyclamen mite is a related species that causes (generally) similar damage. I don’t see this nearly as often on bedding plants, though controls are generally similar to those for broad mite. 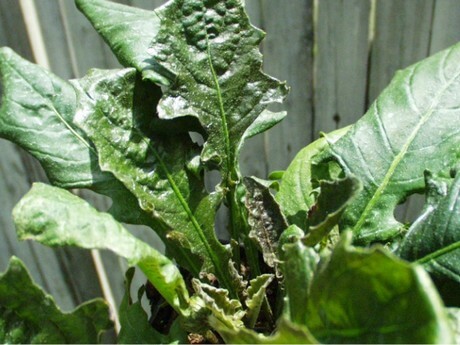 Broad mite damage (leaf curl, stunting, bronzing) to gerbera. 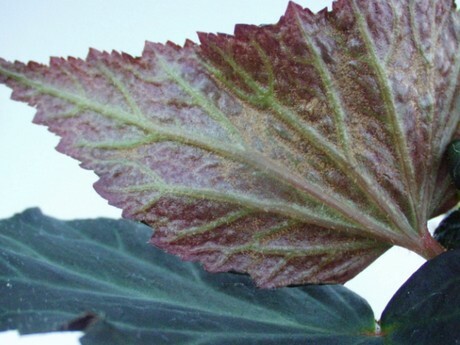 Bronzing injury under begonia leaf from broad mite. Broad mites and four eggs. 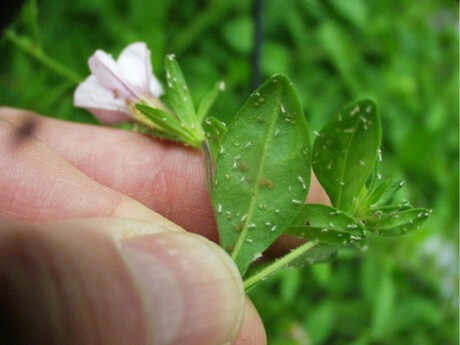 At least three and possibly four species of aphids are responsible for many complaints about aphid infestations on calibrachoa in recent years, including potato, foxglove (which can cause foliar distortion), green peach and tobacco aphids. Sometimes two or more are present at the same time. Drenches with imidacloprid prior to hanging may fail for a variety of reasons, such as poor root uptake on just-planted plugs, leaching, and possibly tolerance or resistance, so for plants destined for baskets one can make another reasonable case for preventive treatments to flats prior to transplanting, particularly in light of some reports of difficulty with aphid biocontrols on this crop. Aria and Endeavor are particularly effective materials for aphids with some translaminar activity; Kontos, Mainspring, and the high label rate of Avid (or generic) are also effective with some translaminar or systemic activity. Horticultural oil and insecticidal soap can be used but require good contact, and if neonicotinoids (TriStar, Marathon, Safari or generics) are an option they generally have moderate to excellent efficacy against aphids. Again note sensitive plants on some labels. 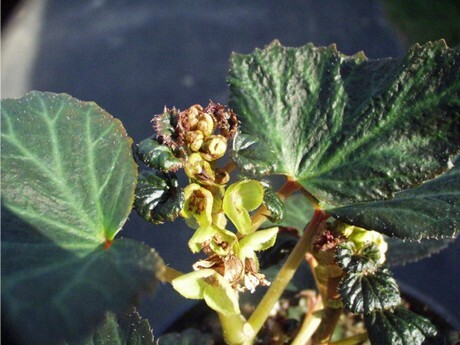 Severe stunting and leaf distortion on begonia from broad mite infestation. Tobacco aphids and cast ‘skins’ on calibrachoa. We’ve been watching a small population of WFT in our greenhouse thriving on powdery mildew (the thrips will feed on the spores) while showing little interest in or damage to the foliage itself. This is another of the insidious ways WFT can maintain itself through winter until our regular crops come on in the next couple of weeks. (Outdoor thrips sources don’t seem to be an issue for us until late in summer or early fall.) We plan to attack the situation shortly employing insecticides, appropriate fungicide treatments, and removing and bagging at least the early flowers (with thrips inside). Current cool conditions and short daylength are not yet favorable for biocontrols which are best used more preventively. Some of the more effective treatment choices for WFT include Overture, Pylon, Mainspring, Hachi-Hachi (not for NY), Mesurol and possibly Conserve/Entrust assuming resistance is not an issue. Pedestal and Kontos target immature stages and can be helpful in rotation. Be sure to note plant sensitivities on labels. We’ll keep these infested plants away from new crops until sure the thrips population is very low. Immediately following treatment, blue or yellow sticky cards will be set up and we’ll watch for early signs of damage (scarring or distortion) on young leaves to help indicate how well we’re doing. Once plants are large, canopies are dense, and bloom starts control becomes much more difficult.